Please join me for my second solo show The Mechanicals: The Art of Automata which is presented as part of Crafted Vancouver, an exciting 25-day showcase of local, national and international craft. 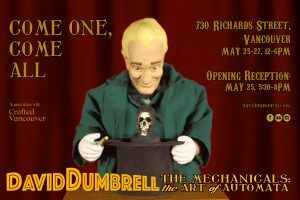 The Mechanicals: The Art of Automata will run from May 25-27 at Studio 730, 730 Richards, Vancouver, 12-6pm. Opening reception Friday May 25, 5:30-8pm. For more information on Crafted Vancouver, click here.